Federal and state governments are ramping up their use of blockchain technology in a growing trend that backers say will be a powerful boost to widespread private-sector adoption. The federal government has awarded $1.3 million in blockchain technology contracts so far this year, up from slightly more than $100,000 in 2016, the first year it awarded the contracts, according to Bloomberg Government data. The figure is likely to grow next year, according to Bloomberg Government analyst Samantha Stein. Government interest in the technology has grown from a handful of studies and testing initiatives in 2015 and 2016 to full-fledged pilot programs and interagency coordination in the Department of Homeland Security, the General Services Administration and the state of Delaware. But technical limitations, a shortage of blockchain-savvy talent and a need to educate policymakers and government workers on how blockchain works could slow its adoption. Companies such as International Business Machines Corp. and Microsoft Corp. that are investing in the technology may gain potentially lucrative government contracts. But government adoption of blockchain could also could lead to more private-sector business, as commercial entities working with the government start using the platforms too, Mark Fisk, IBM’s public service blockchain leader, told Bloomberg BNA. The number of federal government pilot programs and testing trials have increased in the last several months, according to Booz Allen Hamilton Inc. senior data scientist Tori Adams. Blockchain participants essentially share a database where parties must agree to each transaction made. The digital-ledger technology was first used to create digital currencies such as bitcoin. Blockchain advocates say it will revolutionize record-keeping and be as transformative for the private sector as the internet. Blockchain-related companies such as Circle Internet Financial Ltd. and Blockstream, Inc. attracted $1.4 billion in global investments from 2015 through the second quarter of 2017, according to a Bloomberg BNA analysis of CB Insights data. Blockchain company representatives, industry consultants and other proponents of the technology say government adoption would help to cement the private sector’s trust in blockchain and spur its growth. They’re also hoping that private sector worries about blockchain reliability and security will be assuaged if the government starts using it widely. Government agencies are attracted to the technology because it can streamline record-keeping and promote transparency and accountability in transactions, Fisk said. Blockchain acts like a shared record book where each party to a transaction— citizens, government agencies or businesses—holds a live copy of the record book and authorizes the legitimacy of the transaction in real time. That means tasks such as authenticating spending contracts, managing property transfers and health care records, and tracking digital copyrights could get done faster with greater accuracy. “The public sector is a very information-intense business, you have a lot of opportunities for blockchain technology,” Rep. Jared Polis (D-Colo.), co-founder of the Congressional Blockchain Caucus, told Bloomberg BNA. Several federal agencies are already exploring blockchain technologies, including the Department of Health and Human Services, the Food and Drug Administration, and the departments of Defense, Commerce, Justice, and Treasury. Others, including the State Department, Postal Service, and Homeland Security, have initiatives to study blockchain applications in areas like international travel, fraud detection in trade, and identity and records management. The GSA held the first inter-agency blockchain forum in July, after various departments asked for help in getting a handle on the technology. The event collected almost 200 possible ways the government might use blockchain from about 100 federal managers from across the executive branch, Justin Herman, director of the administration’s Emerging Citizen Technology program, told Bloomberg BNA. The GSA is also calling for U.S. businesses, federal managers, and civil society groups to propose ways blockchain, artificial intelligence or open data can improve government accountability and transparency in a Sept. 8 workshop. State governments are not sitting on the sidelines. Four states, including Delaware, Illinois, Vermont and Arizona, have enacted laws that establish initiatives and studies of the technology, which have spurred an increasing number of pilot programs and partnerships to leverage the emerging tech, according to Bloomberg Law data. Bills are pending in the Hawaii and Maine legislatures to create working groups to study blockchain technology, determine best practices, and, in Maine, create a report on using blockchain to improve the paper ballot election system. Illinois launched an initiative in 2016 to attract blockchain startups to the state and leverage the tech in internal government operations. State officials are testing blockchain uses for streamlining property deed recording, academic transcript tracking, healthcare provider registries, medical credentialing, green energy credits, and managing birth and marriage certificates, Jennifer O’Rourke, Illinois blockchain business liaison, told Bloomberg BNA. Delaware, the legal home of 86 percent of U.S. initial public stock offerings, according to 2015 state data, started its own initiative last year to attract blockchain companies and look for ways to remove regulatory obstacles to the technology’s use. Delaware enacted a law Aug. 1 aimed at using blockchain tech for corporate record keeping. 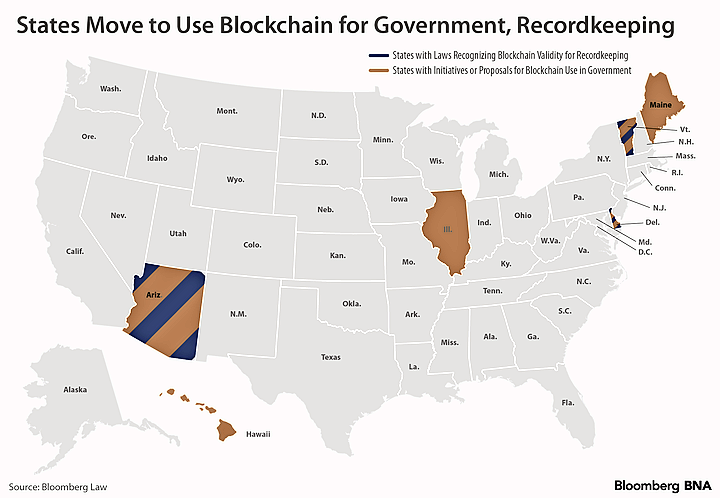 Delaware, Arizona and Vermont, meanwhile, have enacted legislation recognizing the legal validity of agreements built on blockchain platforms, or smart contracts, according to Bloomberg Law data. Still, blockchain faces plenty of obstacles. The nascent tech is being improved to sync with existing technologies and scale to larger applications. Much like the private sector, government workers and policymakers also need to be educated about how the technology works and how it can improve operations, Chamber of Digital Commerce Founder and President Perianne Boring told Bloomberg BNA. Government officials are debating whether smart contracts should be considered legally binding, Boring said. For example, smart contracts can enable actions, like payment releases, without a human signing off. If different states interpret or regulate smart contracts differently, companies creating the technology could face a patchwork of compliance rules, she said. Blockchain providers must demonstrate exactly how the tech can solve government needs, Mark Smith, CEO and co-founder of Symbiont.io, which partners with the Delaware Blockchain Initiative, told Bloomberg BNA. For example, Delaware’s non-standardized record-keeping system for corporations was causing costly errors, so Smith proposed a solution through a blockchain platform. “You have to identify, ‘Here’s a pain point,’ and associate that pain point with tax revenue or cost side ledger,” Smith told Bloomberg BNA. Finding enough technologists with blockchain know-how is another obstacle, Mike Wons, Illinois’ chief technology officer, told Bloomberg BNA. He pointed to the Chicago Blockchain Center, a tech incubator sponsored by the state’s blockchain initiative, as a source for fostering talent. “Those innovation hubs we’re creating in the state—we’re trying to attract people to help us solve these problems,” Wons said. Federal and state leaders in the public sector can help blockchain companies navigate the procurement process and educate government workers who might be leery of new technologies, Andrea Tinianow, director of the Delaware’s Blockchain Initiative, said.